Today, the good folks at Writer Unboxed have chosen to republish my thoughts on The Donald Maass Experience. 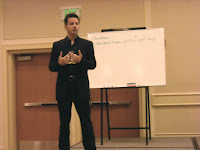 This was an all-day writing class given by well-known, highly talented New York agent Donald Maass at the recent American Christian Fiction Writers conference. It was an eye-opening experience for me. I'm flattered to have my work featured at Writer Unboxed, which is one of the premier web sites for writers. Even if you've already read my thoughts the first time around, you might wish to click the link and see how they look in this new setting. And for the writers among the audience, I'd encourage you to bookmark Writer Unboxed and check it regularly. Writers Digest has named it one of the best 101 web sites for writers for three years running. 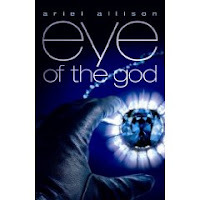 My fellow Abingdon writer, Ariel Allison, is awaiting the October 1 release of her first novel, eye of the god. I was impressed with her writing and fascinated by the history of the Hope Diamond that she incorporated into her novel. She’s graciously consented to join me today for an interview. RM: Ariel, this is your first novel, but you co-authored a non-fiction book. How has this process been different for you? AA: Like night and day. Chocolate and vanilla. With non-fiction there is a theme to the book, but each chapter is independent. With fiction, it’s one living, breathing organism. Every little change affects the entire book. But I must say that I enjoy writing fiction a great deal more. I love taking a blank page and scratching on it until a story emerges. RM: What made you choose the Hope Diamond as the subject for this novel? AA: In the Spring of 1995, I stumbled across an article in Life Magazine on the Hope Diamond. The two-page spread showed Michelle Pfeiffer wearing the jewel and gave a brief history of the legendary curse. I knew instantly that it should to be a novel. Being the curious gal that I am, I dug around and was surprised to find that although most people were familiar with the curse, no one had done anything with the concept. So I began researching and writing. That was fourteen years ago this spring. RM: And was eye of the god your title, or did Abingdon change your original submission to this one? AA: It’s my title actually. It’s the first title I came up with and it never changed through the editorial process. And I’m so glad they kept it because eye of the god just feels “right” for this novel. AA: The whole thing happened really quickly. My agent, Jonathan Clements, sent my proposal to Abingdon shortly after ICRS in 2008. Barbara Scott, my editor, replied to him less than an hour later and said she was “extremely” interested. I had a verbal offer that week and a contract not long after. I’ve spent so much of my career “waiting” that to have everything fall into place so fast was a blessing. RM: How about a little hint for my readers of what eye of the god is about? AA: According to legend, the Hope Diamond was once the eye of a Hindu idol named Rama Sita. When it was stolen in the 17th century, it is said that the idol cursed all those who would possess it. But that doesn’t stop the brilliant and ruthless Weld brothers from attempting to steal it from the Smithsonian. However, they are not prepared for Dr. Abigail Mitchell, the beautiful Smithsonian Director, who has her own connection to the Hope Diamond, and a deadly secret to keep. RM: What’s next for you? AA: At the moment there are fifteen novels in various stages of development tucked away on my hard drive. The two that I am concentrating on at the moment both involve mysteries: one from Shakespeare and one from 1930’s New York City. But you’ll have to wait for details. AA: I think of the quote by Langston Hughes, “Hold fast to dreams, for if dreams die, life is a broken-winged bird that cannot fly.” Dream and do until you wake one day to find it has become reality. Thanks, Ariel. Good luck with the launch of what I'm sure will be the first of many novels for you. I enjoyed reading eye of the god, and hope that my readers will check it out. If you're not a writer, you may never have heard of Donald Maass. He's a respected literary agent whose books, Writing The Breakout Novel and The Fire In Fiction, are must-reads for any novelist wanting to take his writing to the next level. This past week, over 300 members of the American Christian Fiction Writers gathered before their annual meeting in Denver to attend a day-long seminar presented by Maass. I was one of that group, and I thought I'd share my impressions of the day. Now most writers have an innate respect of agents. After all, they're the gatekeepers to editors and publishers. Nowadays, it's pretty well understood that it's easier for a camel to pass through the eye of a needle than for a writer to get his or her work before an editor, much less get it published, without going through an agent. Add to that respect-a respect that sometimes borders on fear-the fact that Maass isn't just a literary agent, he's a New York agent, and the attendee's pulse quickens a bit. Then, when Maass entered the room dressed entirely in black, a fashionable stubble highlighting a severely neutral expression, those of us sitting in the front rows began to rethink our decision. Suppose he calls on us? Will we have to read something from our work-in-progress (the "WIP" we all talk about)? And will he tear it apart? But he quickly put us at ease, making a few jokes about how hard it would be for a New Yorker to control his vocabulary in front of an audience of Christian writers. I'd come to listen, but I was quickly drawn in, entering into the brief writing exercises he gave us, marveling at how simple they seemed once he pointed them out, yet how much they added to the depth of understanding I had about my characters and plots. Rewrite a paragraph from the viewpoint of the antagonist, instead of the protagonist? Why didn't I think of that? Rewrite a bit of dialogue in "rat-a-tat" fashion-short, sharp exchanges? Now I see the meat of what's being communicated. And on it went. We were there for eight hours, interrupted only for a couple of brief breaks and a hurried 45-minute lunch. My attention span is usually not nearly that long, but Maass kept me and the rest of the writers in the room under his spell as he showed us how to plumb the depths of plot and character. He urged us to take our "what if" scenario-what's the worst that can happen if the hero doesn't achieve his goal?-and make it worse...and worse...and worse still. I had the opportunity to speak with Maass a couple of times, and found him to be quite nice. During the breaks, he answered questions from attendees too shy to voice them during the session. He smiled. He chatted. He was nothing like I pictured a New York agent. And he was good. Very good. Would I spend the time and money again? You bet. If you have the opportunity to attend one of his seminars, by all means, do so. Your writing will never be the same. Thanks, Donald Maass. Hope we made a good impression on you. You certainly made a good one on us. I'll be back soon with a report on the ACFW annual meeting, focusing on the day-long session given by Donald Maass. Meanwhile, let's talk about the ways that writers can mangle the English language. It all began when I discovered this sentence in a book I was reading: "He walked into the saloon, a tall man in a dark coat and white shirt wearing a big bone-handled Colt." That immediately gave me an image of a shirt wearing a gun--ludicrous, I'll grant you, but I'd always been told to write for clarity. How about "He walked into the saloon, a tall man, wearing a dark coat and white shirt, a big bone-handled Colt hanging at his side." Nit-picky? Probably. The change the simple insertion of a comma made could have started me thinking about punctuation and given rise to a discussion of Noah Lukeman's classic book, A Dash Of Style. But that's a post for another day. This time my thoughts went in another direction. What was this type of writing error called? Was it a tautology? No, that's using two words to say the same thing twice. Like "free gift," "added bonus," "unsolved mystery." By definition a gift is free, a bonus is added, and a mystery is unsolved. That's not what this represented. Okay, was it an oxymoron? No, I knew that an oxymoron was using two contradictory terms together. The classic example, generally used in jest (I hope), is "military intelligence." Moving on, could this be a non sequitur? I chewed on this for a few seconds before recalling that this would be indicating cause and effect when none existed. Sort of like, "He grew up in poverty, so he would make a fine Mayor." Nope, still not the right word. I'll tell you right now I never found the proper name for the example I quoted. What I did find, though, was something called "fumblerules." These are a set of grammar rules that contain in themselves the error against which they are warning. Example? "Don't use no double negatives." And "The passive voice should never be used." If you know what to call the example I gave at the beginning of this post, please let me know. And I hope all the writers out there will avoid tautologies, oxymorons, non sequiturs, and will take pains to eschew obfuscation. 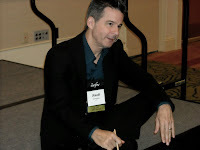 We've just returned from the annual meeting of the American Christian Fiction Writers. It was a good meeting and a great trip--except for some anxious moments this morning. We'd been told that there'd be no problem getting a taxi around 6:00 this morning to take us to the airport, but for some reason the bell captain had to scramble around and finally call one of the nearby hotels to get a taxi for us. It arrived twenty minutes after we had wanted to leave. I was squirming and looking at my watch as we pulled away from the hotel in a taxi driven by a very nice young man. He asked, as taxi drivers tend to do, "Coming from a meeting?" I told him about the ACFW, and he replied, "Christian fiction? Isn't that a contradiction in terms?" I assured him that it was possible to write fiction from a Christian worldview and that many such books didn't beat the reader over the head with a Gospel message so much as show how Christians dealt with the problems that any of us can encounter on a given day. Although he admitted he was an atheist (I think he meant agnostic, but wasn't about to argue semantics), when I told him about my own medical suspense, he said, "I think I'd like to read that." So, when we pulled up at the airport (in plenty of time to make our flight), along with his fare and tip I included a card about Code Blue and the link that allows one to order it for a little more than eight dollars. I hope he takes advantage of the opportunity. I'd spent four days at a conference where each day we learned about sharing our faith through our writing. Then, on the way to the airport, God arranged an opportunity for me to put it into practice. How cool is that? Today I'm posting the first of a series on medical details in fiction over at the blog of the Christian Authors Network (CAN). Hope you'll drop by that site and visit. And come back on the third Friday of each month for the follow-ups. Today marks the start of the American Christian Fiction Writers conference in Denver. Hundreds of men and women, united by their love of fiction written from a Christian worldview, will gather for the meeting. They'll network with others in the profession. There'll be "pitches" for novels during scheduled appointments with editors and agents, at lunch tables, and even during coffee breaks. Only the rest rooms appear to be off limits for presenting a thirty-second tease for what the writer hopes will be the next great novel. I've learned that getting an agent or editor interested in your work isn't the main advantage of these conferences. The real benefit comes in learning more about craft through workshops and continuing education sessions, while making new friends and renewing acquaintances with old ones. I'll be teaching one session, attending others, and meeting with my agent and editor. It should be a busy time, but a good one. I'll be back next week with a report, including my impression of the one-day seminar with super-agent Donald Maass, who'll be teaching us how to bring fire to our fiction. Stay tuned. Even if you haven't seen the movie, Butch Cassidy And The Sundance Kid, chances are that you'll recognize that line. Well, that's the way I'm feeling lately when I check my Facebook page. For those who've been in an underground cave for the past several years, to participate in Facebook you develop a network of "friends." These are the people who can view your posts. In turn, their posts turn up on your wall (ie, your home page). You get to be friends with someone on Facebook by sending a "friend request." When I started using this social networking site, I figured it would be a way to connect with family and close friends, sort of like sending out and receiving a blanket email. But soon I was getting friend requests from people whose names I didn't really recognize. Since my memory for names and faces is less than perfect, I figured I'd run across them somewhere along the way: medical meetings, courses I'd taught, social events, writers' conferences, etc. And I didn't want to make anyone mad, because by this time I'd been counseled that writers need to get their names "out there" (wherever "out there" is), and this was a way to do it. So I accepted the invitation. That's why I sometimes look at my home page and wonder, "Who are these guys?" Of course, it's easy enough to create a list of family and close friends, and that's the one I check on a twice-daily basis. The rest of the time it's sort of fun to scroll down and see what various people are doing. It's a way to get to know some folks, and I suspect that when I see a familiar name badge at the forthcoming American Christian Fiction Writers conference I'll be able to place the person wearing it because I've read some of their Facebook posts. How about you? Do you ever look at the people posting on your Facebook wall and wonder, "Who are these guys?" Do you ignore many friend requests? As you can tell, I still have mixed emotions about social networking. Do you? Captain Jeff Struecker, a decorated former US Ranger, and Alton Gansky, award-winning author, have teamed up to produce a novel that is filled with action and populated with unforgettable characters. While a clandestine operation is taking place in Venezuela, drama continues on the home front as families battle with the problems created by the absence of their loved ones. Despite its setting, the novel deals with emotions and decisions with which the reader can identify. There's tension on every page, and I found myself coming back to this book in every spare moment, anxious to see how the story would unfold. There were mixed emotions when I turned the last page--satisfaction at a story well-told and sadness that there was no more to read. But I hear there's a sequel in the works, and I look forward to reading it. Soon, I hope. On September 11, 2001, Kay and I were in Denver, where I was attending a national medical meeting. Neither of us will ever forget our feelings on that day and the days that followed. Less than a year later, we stood at the site of the Twin Towers and gazed into the huge scar gouged into the landscape of New York. It moved us then. It moves me now as I recall it. So many deaths. So many instances of heroism and dedication. Today our nation observes the eighth anniversary of those attacks that forever changed the way we live. May the lessons that came out of that terrible day never be forgotten. Please pause today and join with others around the land in offering a prayer that such an event will never be repeated. Fly your flag today. Pause to remember. May God bless America. NOTE: Today on Writer Unboxed, my cyberfriend and colleague, Dr. Michael Palmer, and I discuss medical detail in fiction. Check it out. I've been participating in the Thomas Nelson Book Review program for a while now, receiving books of my choosing in return for posting a review of them on my blog and a book-seller's site of my choosing. Let me be clear. The publisher puts no pressure on reviewers to post anything other than an honest opinion. If you don't believe this, check out some of my previous reviews. This opportunity to review the latest book by Max Lucado seemed too good to miss. I have to confess that I might have been the only person among my acquaintances who had never read one of Lucado's books. It's not because they don't come highly recommended, because they do. I've even met the man--briefly--when he was signing books here in Dallas at the Christian Book Expo, and I was impressed. Nevertheless, for whatever reason, I'd never read his work until I picked up Fearless. And it was an eye-opener. In this book, two years in the writing, Lucado deals with the thing that's all around us nowadays: fear. The book examines Jesus' statements about fear and encourages us to take heart in difficult times. I opened it, expecting another saccharine "everything is going to be all right" book. Instead, I found a work that addresses common situations and sources of fear by showing how Jesus addressed them, interspersed with vignettes and examples that brought things down to a personal level. I was especially taken with Lucado's chapter on Fear of Overwhelming Challenges (There's A Dragon In My Closet) and Fear Of Life's Final Moments (Scared To Death). I finished every chapter expecting that he'd run out of situations to address, only to find yet another that spoke to my heart and my current needs. My recommendation: read this book! Buy it if you can, borrow it if you can't. Pass it on to your family and friends. There's enough fear to go around nowadays. This book is a great antidote. This is the Labor Day Weekend. A lot of people consider it the "official" end of summer. For students, it's a chance to have a day off from the classes they've just started. For some workers it's just business as usual, while others get to take the day off. I won't bore you by telling you that the first Labor Day was celebrated on September 5, 1882, and that in 1894 Congress officially declared the first Monday in September to be a national holiday recognizing the efforts of labor. I'll just wish for you and yours a great weekend, however you choose to spend it. Since writing can be construed as "labor," I'm taking Monday off and won't be posting. However, I'll be back on Tuesday, September 8, with a review of an exciting new book. Hope you'll come back then. My friend, the late Dr. William Wright, was one of the pioneers of facial plastic surgery. He taught me a lot, but his most memorable aphorism was this: Perfect is the enemy of good. In the context of facial surgery, he meant that continuing to alter nasal bone or cartilage in search of perfection might leave the patient with a ski-slope nose or a nasal tip tilted so high that the nostrils showed. Trying to achieve just a bit more tightening of the face at the end of a face-lift could give the patient skin off which you could bounce a quarter and eyes that might not fully close. Not to get too technical (and it's probably too late for that--sorry), he was saying that you have to know when you've done your very best, then quit. Isn't this true in most phases of life? Looking for that perfect dress or suit? Seeking the perfect skillet for your kitchen? Trying to find the ideal vacation spot? There has to come a time when we say, "I'm not going to find anything that is perfect, but this is good...very good. I'll take it." Authors have this problem when they are doing the final edits for their work. How do you know when to quit? Does that scene truly work? Is this dialogue too stilted? Should I throw out the whole first chapter? (By the way, that often works well. In too many draft manuscripts, the real action doesn't begin until chapter two). So what's the answer? How does a writer know when to quit? My approach is to write and edit as I go along, reading the preceding chapter and editing it before starting the next. When the whole work is complete, I lay it aside for a few weeks and then do another complete edit. A third pass precedes my submission to my agent (who will almost always have her own suggestions, which I take). Then the editor will do yet another edit. By this time, we hope to have achieved something that's very good. Perfection? I'm not sure I've ever read a novel that's perfect. But, after all, perfect is the enemy of good. Have you ever read a novel you consider perfect? Would you settle for one that's just very good? Lisa Jordan interviewed me about the sale of my first novel and posted it on the American Christian Fiction Writers website in their ezine, Afictionado. After seeing the way Lisa prefaced the interview, I have to wonder if she might have had a problem with doctors in the past. Here's what she says: "Hello Dr. Richard Mabry and welcome to “My First Sale”. Please remove your clothing and put on this gown then hop up on that metal gurney. Dr. Jordan is running about 30 minutes behind, but will be with you shortly to begin the, uh, examination." But it's a good piece, and I hope you'll take a moment to read it. Just click on this link. On a more somber note, we just learned that a dear friend has been stricken with cancer. I don't want to give any details, but would ask that readers of this blog join your prayers with ours for Rick. Thank you.